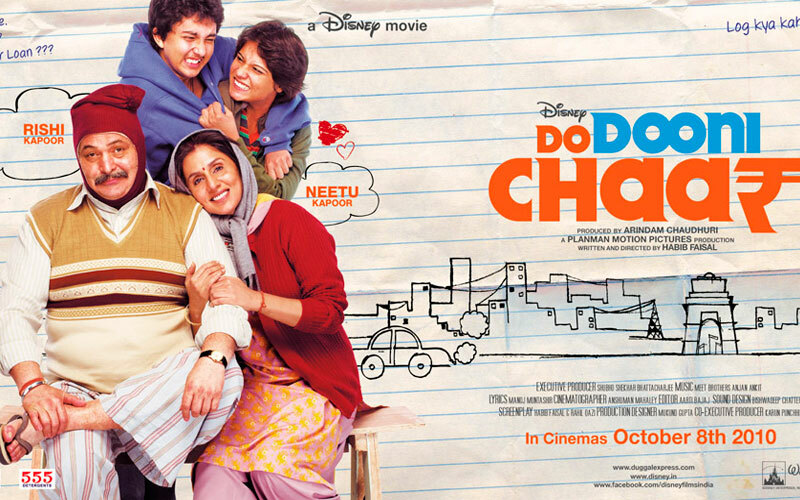 I was pleased to see this as part of the Indian Film Festival as Do Dooni Chaar didn’t get a cinema release here, despite starring legendary couple Rishi and Neetu Kapoor. It only attracted a very small audience at this showing—maybe 20 people —which really surprised me. Half of that number ran for the door when the subtitles failed to materialise, in search of someone in charge. But all was OK. The film was restarted (the Indian audience members complained loudly and jokingly about having to watch the titles again), the subs kicked in and we all settled down. Well, I hadn’t moved. I was going to watch it regardless so it was more fun to listen to all the huffing and grumbling! The film was picked up for distribution by Disney and that tells you almost everything you need to know. It’s a nice film with message about decency and family, all wrapped up in a sweet sentimental shell. There’s nothing to object to, but I didn’t feel there was much to get excited about either. It was just… nice. And sometimes a nice film is just what you want. Rishi Kapoor plays Santosh Duggal, a maths teacher and father of two. His wife Kusum (Neetu Kapoor) runs the household on his very limited income and maintains the cramped apartment to the best of her ability. The kids, Payal (Aditi Vasudev) and Deepu (Archit Krishna), are typical teenagers and want all the latest things and best brands. They don’t have a lot of respect for their father, and see his poverty and lowly job rather than his values and intelligence. The film opens to an argument about how Santosh’s INR7700 tax refund would be spent. The Duggals are a noisy, argumentative family, and the scene is punctuated by doors slamming and lots of shouting as people careen around the tiny flat. Kusum wants a fridge while the kids want everything from an iPod to dish TV. Payal, depressed by her lack of cash and stylish clothes, is a moody teen who bosses her weedy boyfriend around. Deepu, or as he prefers to be called, Sandy is cruising by on charm. Until he comes unstuck, Sandy is a slick character with an eye for the girls and an unusual fried chicken based romantic style. The central issue of the film is the pressure on Santosh to buy a car to replace his antique scooter. The car represents so many things to the Duggal family; success, status, independence, pride. But they can’t afford it. They have to budget carefully to have chicken for dinner so a car is a huge deal. The stress of this situation almost drives Santosh to make some extremely dubious decisions and accept money for giving a bad student a passing grade. He seems to embody the nice guy who finishes last, held back by his honesty and simplicity. He refuses to allow Payal to take a call centre job, ostensibly because it will delay her education, but as Kusum points out he also forced her to leave work on their marriage. She is at her wit’s end trying to keep up with the needs of her family when outgoings always exceed their income. The clash of old school and new world thinking is played really well and the arguments have the authentic ring of conversations that have been had over and over. Rishi is so effective in the quieter, more soulful, moments when he drops some of his actorly mannerisms and he really looks and sounds like a tired dad. He has a lovely conversation with Deepu/Sandy where they talk about why Santosh didn’t fly into a rage over a discovery and ends with him quietly asking the boy to make the right choices. Santosh’s relationship with Payal is more challenging and those scenes are more vocal and aggressive. But Payal discovers a new admiration when she sees how much he meant to his old students, and how highly they thought of him for his work ethic and standards. I have to say, Rishi didn’t look at all at home in the tiny apartment and I wonder if he went to boot camp to learn to handle an iron. Neetu plays Kusum as the driving force inside the family home, channelling her energy into alternately cajoling and threatening her husband and kids. She is charming and energetic, refusing to let the exhaustion of her routine slow her down. Santosh and Kusum have a very delicately played scene where they try not to discuss the potential bribe, and Kusum is all for taking it although she doesn’t want to do anything seriously wrong. In a scene at a family wedding, Neetu drags Rishi out to dance and they prove the old sparkle is still there, even if his moves are suspect. There would be something a bit amiss if they didn’t have great chemistry! I wish I hadn’t read some interviews with the Kapoors about the making of the film. They both went on a bit too much about how their costumes were just average off the rack shop bought clothes and how they didn’t mind wearing something so common to make the film work (I’m paraphrasing). So every time Rishi pulled on another of his knitted vests, I felt an eyeroll coming on. But Rishi IS synonymous with knitwear so it was also quite pleasing. The supporting cast were all good. I especially liked Aditi Vasudev’s performance. She was bratty and whiny but also had Kusum’s strength of will. She wasn’t at all glamorous, and looked like a typical student. 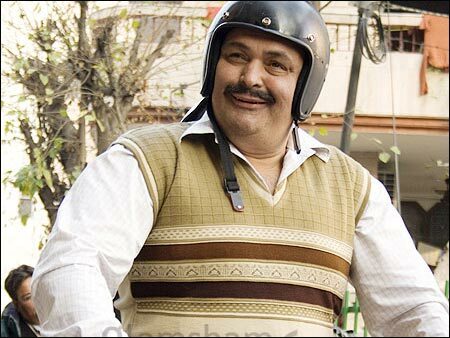 Akhilendra Mishra was also fun as the neighbour Farooqui. He and Rishi had some lovely scenes as the men tried to avoid their warring wives. I really enjoyed the family scenes, and thought the dialogue was excellent in those episodes. I was less taken in by the scenes with the neighbours, and the final ‘I just make sweets but a good teacher makes great human beings’ speech was just too much for my taste. The message had been coming through loud and clear so being hit over the head with it for the final fifteen minutes or so was overkill. I also loved the neighbourhood locations and the glimpses of shops, houses, schools and other settings. I always like a film that gives me a strong sense of place and Habib Faisal did an excellent job in making the locations seem so real. The soundtrack is punchy and matched the inner city feel perfectly. It was a pleasant enough way to spend a couple of hours, and always nice to see old favourites show they still have form. It’s an almost old-fashioned film, and it promotes values of decency and honesty. It is very sentimental, but not too syrupy. I give Do Dooni Chaar 3 stars. This entry was posted in Bollywood and tagged Aditi Vasudev, Akhilendra Mishra, Archit Krishna, Bollywood, Do Dooni Chaar, Habib Faisal, Hindi, Indian Film Festival, Neetu Kapoor, Neetu Singh, Rishi Kapoor. Bookmark the permalink. OBVIOUSLY the boy flirts with fried chicken because he is (cinematically) A KAPOOR. It is the way of his people. This is a really lovely write-up and I’m so glad to hear about a lot of the details and the things they might have done better; seems like most of the other reviews I read did little other than SQUEEEEEE over Neetu and Rishi (understandable to a point). I absolutely must get my hands on this film immediately! Well Beth, he also uses the same technique with a Toblerone so who knows? I think Rishi and Neetu almost worked against the film in some respects. It was lovely to see her back on screen again, and he was good as the confused dad, but I was never not conscious that I was watching a KAPOOR acting. I think you’ll probably like this as you’re so fond of the stars and it’s a nice little slice of life family drama. I haven’t actually seen this one yet – but based on Temple’s review I plan to hunt out the DVD 🙂 It sounds good, and I can rarely pass up a chance to watch Rishi! Unfortunately I was working and not able to see this at the festival this time – grr! Ha! No beating coming your way Pooja 🙂 It was a perfectly nice film and some scenes reminded me of my family too! I tend not to really like Message Films, and this one was so heavy handed and it lost me towards the end. But I did really like the scenes within the family home and their conversations, and that’s where the cast really shone. Beth and Heather are both Rishi fans but I’m not so much. He bears a terribly strong resemblance to an Australian TV host from the 70s and I just couldn’t take him seriously as a romantic hero. I like Rishi as a character actor much more, loved him in Luck By Chance, and he is good in this – although ironing is not his forte! You don’t hear much about this film, but I’m very curious for it!